A hydroelectric plant converts the potential energy of water into electricity by the use of flowing water. This water flows in water streams with different slopes giving rise to different potential for creating heads (size of fall), varying from river to river. The capacity (power) of a plant depends on the head (change in level) and flow as a result of the hydrology in the catchment area of a river. This type of plant typically uses weirs to divert water to the intake. From there it is led to the turbines via a pressure pipe or penstock. An alternative to penstocks, which in many cases is more economic, relies on a canal with reduced gradient running alongside the river. The canal carries the water to the pressure intake, and then, in a short penstock, to the turbines. This kind of project is appropriate to river valleys, particularly in the lower reaches. Either the water is diverted to a power intake with a short penstock, or the head is created by a small dam, complete with integrated intake, powerhouse and fish ladder. What are the main types of hydro schemes? Run-of-river hydro plants use the river flow as it occurs, the filling period of its reservoir being practically negligible. The majority of small hydropower plants are run-of-river plants because of the high construction cost of a reservoir. Pondage hydro plants are plants in which the reservoir permits the storage of water over a period of a few weeks at most. In particular, a pondage hydro plant permits water to be stored during periods of low load to enable the turbine to operate during periods of high load on the same or following days. Some small hydropower plants fall into this type, especially high head ones with high installed capacities (> 1.000 kW). Reservoir hydro plants are plants in which the filling period of the reservoir is longer than several weeks. It generally permits water to be stored during high water periods to enable the turbine to operate during later high load periods. As the operation of these plants requires the construction of very large basins, practically no small or micro hydropower plant is of this type. What are the typical characteristics of small-sized hydro schemes? Micro-hydro power schemes normally only support investment in large reservoirs if these are built for other purposes in addition to hydropower (e.g. water abstraction systems, flood control, irrigation networks, recreation areas). Nevertheless, there are ingenious solutions for linking and fitting the turbine in waterways designed for other purposes, e.g. schemes integrated with an irrigation canal or a water abstraction system. 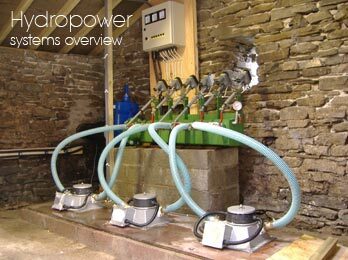 Below are a few examples of several possible applications of small, mini and micro hydropower plants. EXAMPLE-1 The canal is enlarged to the extent required to accommodate the intake, the power station, the tailrace and the lateral bypass. The scheme should include a lateral bypass to ensure an adequate water supply for irrigation, should the turbine be shut down. This kind of scheme should be designed at the same time as the canal, because the widening of the canal in full operation is an expensive option. EXAMPLE-2 The canal is slightly enlarged to include the intake and spillway. To reduce the width of the intake to minimum, an elongated spillway should be installed. From the intake, a penstock running along the canal brings the water under pressure to the turbine. The water, once through the turbine, is returned to the river via a short tailrace. As fish are generally not present in canals, fish passes are usually unnecessary. Drinking water is supplied to a city by conveying the water from a headwater reservoir via a pressure pipe. Usually in this type of installation, the dissipation of energy at the lower end of the pipe at the entrance to the Water Treatment Plant is achieved through the use of special valves. The fitting of a turbine at the end of the pipe, to convert this otherwise lost energy to electricity, is an attractive option, provided that waterhammer, which would endanger the pipe, is avoided. Waterhammer overpressures are especially critical when the turbine is fitted on an old pressure pipe. The installation of a small hydropower plant in a sluice system along large rivers can be an interesting multi-purpose use of existing structures dedicated to other purposes. The exploitation for hydroelectric purposes of the head created by a sluice system allows the production of energy by a renewable energy source without further significant environmental impacts. An interesting and recent example of this application is given by a pilot project where a 26 kW turbine unit of four parallel 6.5kW propeller turbines has been inserted in an old sluice constructed for agricultural purposes at Niemieryczow in Poland. This rather unusual application is very interesting from an environmental point of view. Ramps are often constructed to stabilize the river course, particularly on fast flowing mountain rivers. The artificial head created by the ramps or by a series of check dams can be exploited for hydroelectric production. Installed power is however generally small since the flows and heads are generally low. Nevertheless this application represents an opportunity to meet the twin objectives of river protection and the use of a renewable energy source for energy production at the same time. Bed load barriers create an artificial head in the watercourse which can be exploited for energy production. How to choose a site from a technical point of view? Apart from the environmental issues, which will be discussed in detail in later chapters, a MHPP should consider the following three main issues if it is to be economically feasible. What does the power of an MHPP depend on? The amount of electricity generated is the result of the head and the flow rate at a specific site. The power generated also depends on the turbine generator efficiency and pressure losses at the intake and penstock. Moreover, other constraints, such as environmental issues and fisheries, may oblige the developer to leave a minimum flow in the watercourse. It should also not be forgotten that the available energy depends on the day-to-day and year-to-year variations of the flow. The impact of these variations could be very significant, so careful measurements should be made. What parameters are used in selecting a hydro turbine? Head, flow and power are the three main technical aspects in selecting a turbine. There are five main turbine types and each might be appropriate to certain physical conditions at each site. These only use the speed of the water, i.e. only use kinetic energy. This type of turbine is appropriate for high heads (75 meters to >1000 meters) and small flows. The most popular such turbines are Pelton Wheels, which have a circular disc or runner with assembled vanes or double-hollow spoons. There are also other models like the Turgo side injection turbine, and the Ossberger or Banki Mitchell double propulsion turbines (these are further described in the text as “crossflow on Banki Mitchel turbine”). 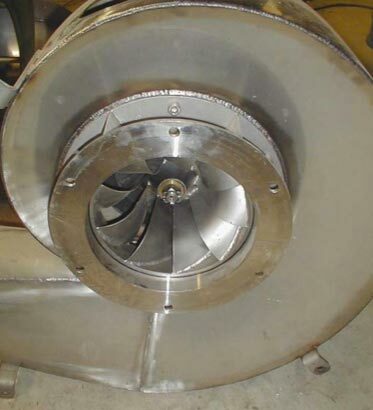 This kind of turbine takes advantage of the water speed, and the pressure maintains the flow when contact takes place. The most frequently used are Francis and Kaplan turbines. Usually they have four basic elements: the casing or shell, a distributor, a pad, and the air intake tube. There are two distinct groups: radial turbines (Francis type) are suitable for operating on sites with a medium head and flow and axial turbines (Kaplan and Propeller type) are appropriate for operation with low heads and high and low flows. Both action and reaction turbines may be used in MHPP. What are the differences between the turbines? Pelton turbine: is a typical high head turbine, which can also be used for medium heads, with power ranging from 5 kW to large sizes. This is an easy to use action-type turbine with a high efficiency curve and it has a good response to variations in flow. Cross Flow or Banki Mitchell turbines: are mainly used at sites where there is low installed power. In general their overall efficiency (around 75-80%) is lower than conventional turbines. They have a good response to variations in flow, which makes them appropriate for work where there is a wide range of flows. They have the advantage of simplicity and ease of maintenance and repair. They are a tried and proven technology which can exploit sites that cannot otherwise be used economically and where, therefore, their limited efficiency is not relevant. They are suitable for low to high head sites from 1 m to 200 m head with flows over 100 l/s. Francis Turbines: are single regulated turbines more appropriate to use with higher heads given their efficiency. Propeller turbines: have the advantage of running at high speeds even at low heads. Kaplan Turbine are high efficiency propeller-type turbines, very advanced and consequently quite expensive in investment and maintenance. Their response to different ranges of flow conditions is very good.More is said about propeller turbines in the next chapter. Hydropower (from hydro meaning water) is energy that comes from the force of moving water. The fall and movement of water is part of a continuous natural cycle called the water cycle. Energy from the sun evaporates water in the earth’s oceans and rivers and draws it upward as water vapor. When the water vapor reaches the cooler air in the atmosphere, it condenses and forms clouds. The moisture eventually falls to the earth as rain or snow, replenishing the water in the oceans and rivers. Gravity drives the water, moving it from high ground to low ground. The force of moving water can be extremely powerful. Hydropower is called a renewable energy source because the water on the earth is continuously replenished by precipitation. As long as the water cycle continues, we won’t run out of this energy source. Hydropower has been used for centuries. The Greeks used water wheels to grind wheat into flour more than 2,000 years ago. In the early 1800s, American and European factories used the water wheel to power machines. The water wheel is a simple machine. The water wheel is located below a source of flowing water. It captures the water in buckets attached to the wheel and the weight of the water causes the wheel to turn. Water wheels convert the potential energy (gravitational energy) of the water into motion. That energy can then be used to grind grain, drive sawmills, or pump water. In the late 19th century, the force of falling water was used to generate electricity. The first hydroelectric power plant was built at Niagara Falls in 1879. In the following decades, many more hydroelectric plants were built. At its height in the early 1940s, hydropower provided 33 percent of this country’s electricity. By the late 1940s, the best sites for big dams had been developed. Inexpensive fossil fuel plants also entered the picture. At that time, plants burning coal or oil could make electricity more cheaply than hydro plants. Soon they began to underprice the smaller hydroelectric plants. It wasn’t until the oil shocks of the 1970s that people showed a renewed interest in hydropower. It’s easier to build a hydro plant where there is a natural waterfall. That’s why the first hydro plant was built at Niagara Falls. Dams, which are artificial waterfalls, are the next best way. Dams are built on rivers where the terrain will produce an artificial lake or reservoir above the dam. Today there are about 80,000 dams in the United States, but only three percent (2,000) have power-generating hydro plants. Most dams are built for flood control and irrigation, not electric power generation. A dam serves two purposes at a hydro plant. First, a dam increases the head or height of the water. Second, it controls the flow of water. Dams release water when it is needed for electricity production. Special gates called spillway gates release excess water from the reservoir during heavy rainfalls. As people discovered centuries ago, the flow of water represents a huge supply of kinetic energy that can be put to work. Water wheels are useful for generating mechanical energy to grind grain or saw wood, but they are not practical for generating electricity. Water wheels are too bulky and slow. Hydroelectric plants are different. They use modern turbine generators to produce electricity, just as thermal (coal, oil, nuclear) power plants do, except that they do not produce heat to spin the turbines. a power plant where the electricity is produced. To generate electricity, a dam opens its gates to allow water from the reservoir above to flow down through large tubes called penstocks. At the bottom of the penstocks, the fast-moving water spins the blades of turbines. The turbines are connected to generators to produce electricity. The electricity is then transported via huge transmission lines to a local utility company. The amount of electricity that can be generated at a hydro plant is determined by two factors: head and flow. Head is how far the water drops. It is the distance from the highest level of the dammed water to the point where it goes through the power-producing turbine. Flow is how much water moves through the system––the more water that moves through a system, the higher the flow. Generally, a high-head plant needs less water flow than a low-head plant to produce the same amount of electricity. One of the biggest advantages of a hydropower plant is its ability to store energy. The water in a reservoir is, after all, stored energy. Water can be stored in a reservoir and released when needed for electricity production. During the day when people use more electricity, water can flow through a plant to generate electricity. Then, during the night when people use less electricity, water can be held back in the reservoir. Storage also makes it possible to save water from winter rains for summer generating power, or to save water from wet years for generating electricity during dry years. 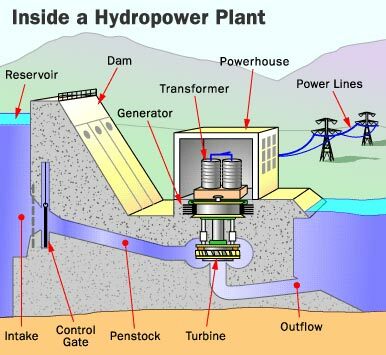 Some hydro plants use pumped storage systems. A pumped storage system operates much as a public fountain does. The same water is used again and again. At a pumped storage hydro plant, flowing water is used to make electricity and then stored in a lower pool. Depending on how much electricity is needed, the water may be pumped back to an upper pool. Pumping water to the upper pool requires electricity so hydro plants usually use pumped storage systems only when there is peak demand for electricity. Pumped hydro is the most reliable energy storage system used by American electric utilities. Coal and nuclear power plants have no energy storage systems. They must turn to gas and oil-fired generators when people demand lots of electricity. They also have no way to store any extra energy they might produce during normal generating periods. How much electricity do we get from hydropower today? 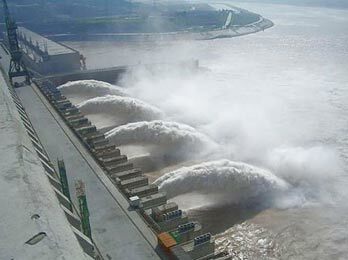 Depending on the amount of rainfall, hydro plants produce from five to ten percent of the electricity produced in this country (10 percent in 1997, 5.9 percent in 2008 due to the droughts in the west. In Oregon, Washington, and Idaho, hydropower supplies over 73 percent of the electricity each year. Today, there are about 78 million kilowatts of hydro generating capacity in the United States. That’s equivalent to the generating capacity of 80 large nuclear power plants. The biggest hydro plant in the U.S. is located at the Grand Coulee Dam on the Columbia River in northern Washington State. The United States also gets some hydropower generated electricity from Canada. Some New England utilities buy this imported electricity. What does the future look like for hydropower? The most economical sites for hydropower dams have already been developed so the development of big hydro plants is unlikely. Existing plants could be enlarged to provide additional generating capacity. Plus, many flood-control dams not equipped for electricity production could be retrofitted with generating equipment. The Federal Energy Regulatory Commission estimates 30 thousand megawatts of additional generating capacity could be developed in the United States. Demand for electricity is not steady; it goes up and down. People use more electricity during the day when they are awake and using electrical appliances, and less at night when they are asleep. People also use more electricity when the weather is very cold or very hot. Electric utility companies have to produce electricity to meet these changing demands. Baseload power is the electricity that utilities have to generate all the time. For that reason, baseload power should be cheap and reliable. Hydropower meets both these requirements. Generating electricity with hydropower is the cheapest way to generate electricity in the U.S., and the fuel supply flowing water is always available. Hydro plants are more energy efficient than most thermal power plants, too. That means they waste less energy to produce electricity. In thermal power plants, a lot of energy is lost as heat. Hydro plants are about 95 percent efficient at converting the kinetic energy of the moving water into electricity. Hydropower is the cheapest way to generate electricity today. No other energy source, renewable or nonrenewable, can match it. Today, it costs about one cent per kWh (kilowatt-hour) to produce electricity at a typical hydro plant. In comparison, it costs coal plants about three cents per kWh and nuclear plants about two cents per kWh to generate electricity. Producing electricity from hydropower is cheap because, once a dam has been built and the equipment installed, the energy source—flowing water—is free. and expensive process. Many environmental impact studies must be undertaken and as many as 13 state and federal agencies must be consulted. It takes anywhere from three to seven years to get a license to build a hydroelectric dam or a relicense to continue operations. Hydropower dams can cause several environmental problems, even though they burn no fuel. Damming rivers may permanently alter river systems and wildlife habitats. 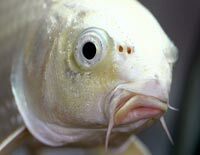 Fish, for one, may no longer be able to swim upstream. Hydro plant operations may also affect water quality by churning up dissolved metals that may have been deposited by industry long ago. Hydropower operations may increase silting, change water temperatures, and lower the levels of dissolved oxygen. operations. Hydropower has advantages, too. Hydropower’s fuel supply (flowing water) is clean and is renewed yearly by snow and rainfall. Furthermore, hydro plants do not emit pollutants into the air because they burn no fuel. With growing concern over greenhouse gas emissions and increased demand for electricity, hydropower may become more important in the future. Hydropower facilities offer a range of additional benefits. Many dams are used to control flooding and regulate water supply, and reservoirs provide lakes for recreational purposes, such as boating and fishing. The generator converts the rotational energy from the turbine shaft into electricity. Efficiency is important at this stage too, but most modern, well-built generators deliver good efficiency. Direct current (DC) generators, or alternators with rectifiers, are typically used with small household systems, and are usually augmented with batteries for reserve capacity, as well as inverters for converting the electricity into the AC required by most appliances. DC generators are available in a variety of voltages and power outputs. AC generators are typically used with systems producing about 3 KW or more. AC voltage is also easily changed using transformers, which can improve efficiency with long transmission lines. A view into a turbine shows a relatively large (2 feet in diameter) Pelton wheel. Peltons vary in size from 3 inches to 13 feet or more, depending on head and flow. Depending on your requirements, you can choose either single-phase or three-phase AC generators in a variety of voltages. One critical aspect of AC is frequency, typically measured as cycles per second (cps) or Hertz (Hz). Most household appliances and motors run on either 50 Hz or 60 Hz (depending on where you are in the world), as do the major grids that interconnect large generating stations. Frequency is determined by the rotational speed of the generator shaft; faster rotation generates a higher frequency. In battery-based hydro systems, the inverter produces an AC waveform at a fixed frequency. In batteryless hydro systems, the turbine controller regulates the frequency. At the bottom of the penstock, a manifold routes water to the four nozzles of a Harris Pelton turbine that drives a permanent magnet alternator. Pure AC hydro systems have no batteries or inverter. AC is used by loads directly from the generator, and surplus electricity is burned off in dump loads—usually resistance heaters. Governors and other controls help ensure that an AC generator constantly spins at its correct speed. The most common types of governors for small hydro systems accomplish this by managing the load on the generator. With no load, the generator would “freewheel,” and run at a very high rpm. By adding progressively higher loads, you can eventually slow the generator until it reaches the exact rpm for proper AC voltage and frequency. As long as you maintain this “perfect” load, known as the design load, electrical output will be correct. You might be able to maintain the correct load yourself by manually switching devices on and off, but a governor can do a better job— automatically. By connecting your hydro system to the utility grid, you can draw energy from the grid during peak usage times when your hydro system can’t keep up, and feed excess electricity back into the grid when your usage is low. In effect, the grid acts as a large battery with infinite capacity. If you choose to connect to the grid, however, keep in mind that significant synchronization and safeguards must be in place. Grid interconnection controls do both. They will monitor the grid and ensure that your system is generating compatible voltage, frequency, and phase. They will also instantly disconnect from the grid if major fluctuations occur on either end. Automatic disconnection is critical to the safety of all parties. At the same time, emergency shutdown systems interrupt the water flow to the turbine, causing the system to coast to a stop, and protecting the turbine from overspeed. A DC hydro system works very differently from an AC system. The alternator or generator output charges batteries. A diversion controller shunts excess energy to a dump load. An inverter converts DC electricity to AC electricity for home use. DC systems make sense for smaller streams with potential of less than 3 KW. AC systems are limited to a peak load that is equivalent to the output of the generator. With a battery bank and large inverter, DC systems can supply a high peak load from the batteries even though the generating capacity is lower. Series charge controllers, like those used with solar- electric systems, are not used with hydro systems since the generators cannot run without a load (open circuit). This can potentially damage the alternator windings and bearings from overspeeding. Instead, a diversion (or shunt) controller must be used. These normally divert energy from the battery to a resistance heater (air or water), to keep the battery voltage at the desired level while maintaining a constant load on the generator. The inverter and battery bank in a DC hydro system are exactly the same as those used in battery-based, solar-electric or wind-electric systems. No other special equipment is needed. Charge controller settings may be lower than used in typical PV and wind systems, since hydro systems are constant and tend to run with full batteries much of the time. If you expect to sell electricity back to the utility, pay extra attention to the efficiency of your hydro system because higher output and a lower cost-per-watt will go straight to your bottom line. Your turbine manufacturer can give you guidance on the most efficient design, as well as grid interconnection controls and safeguards. If you’re off- grid, and your site doesn’t have lots of head and flow, high efficiency can make the difference between ample electricity for your needs and having to use a backup, gasoline- powered generator. A Canadian-made Energy Systems and Design turbine uses a permanent magnet alternator and a turgo runner. The 4-inch (10 cm) turgo runner in an Australian-made Platypus turbine. 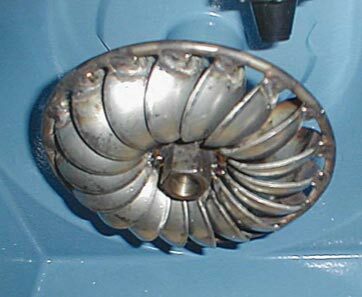 The underside of a low-head, high-flow Nautilus turbine showing the Francis runner, and above it, the innovative nautilus-shaped headrace. Whether a hydro system generates a few watts or hundreds of megawatts, the fundamentals are the same. Head and flow determine how much raw water power is available, and the system efficiency affects how much electricity will come out the other end. Each component of a hydro system affects efficiency, so it’s worthwhile to optimize your design every step of the way. Frictional Head Loss: Refers to the quantity of water supplied from a water source or exiting a nozzle per unit of time. Commonly measured in gallons per minute (gpm). A type of reaction hydro-turbine used in low to medium heads. It consists of fixed vanes on a shaft. Water flows down through the vanes, driving the shaft. Lost energy due to pipe friction. 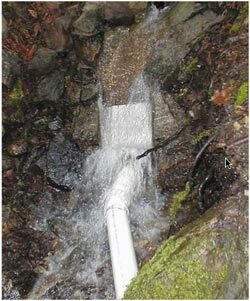 In hydro systems, pipe sized too small can lead to serious friction losses. The difference in elevation between a source of water and the location at which the water from that source may be used (synonym: vertical drop). Expressed in vertical distance or pressure. A flume or channel that feeds water into a hydro turbine. Any electricity that is generated by the flow of water. Turbines with runners that operate in air, driven by one or more high-velocity jets of water from nozzles. Typically used with moderate- to high- head systems. Examples include Pelton and turgo. 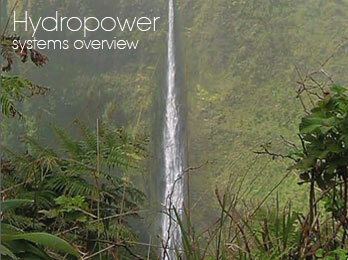 Hydropower is based on simple concepts. Moving water turns a turbine, the turbine spins a generator, and electricity is produced. Many other components may be in a system, but it all begins with the energy already within the moving water. Water power is the combination of head and flow. Both must be present to produce electricity. 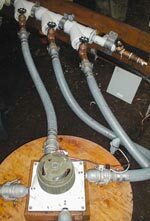 Consider a typical hydro system. Water is diverted from a stream into a pipeline, where it is directed downhill and through the turbine (flow). The vertical drop (head) creates pressure at the bottom end of the pipeline. The pressurized water emerging from the end of the pipe creates the force that drives the turbine. More flow or more head produces more electricity. Electrical power output will always be slightly less than water power input due to turbine and system inefficiencies. Head is water pressure, which is created by the difference in elevation between the water intake and the turbine. Head can be expressed as vertical distance (feet or meters), or as pressure, such as pounds per square inch (psi). Net head is the pressure available at the turbine when water is flowing, which will always be less than the pressure when the water is turned off (static head), due to the friction between the water and the pipe. Pipeline diameter has an effect on net head. Flow is water quantity, and is expressed as “volume per time,” such as gallons per minute (gpm), cubic feet per second (cfs), or liters per minute. Design flow is the maximum flow for which your hydro system is designed. It will likely be less than the maximum flow of your stream (especially during the rainy season), more than your minimum flow, and a compromise between potential electrical output and system cost. Head and flow are the two most important things you need to know about your site. You must have these measurements before you can seriously discuss your project, how much electricity it will generate, or the cost of components. Every aspect of a hydro system revolves around head and flow. In Part 2 of this series, we will discuss how to measure them. While some losses are inevitable as the energy in moving water gets converted to electricity, they can be minimized with good design. Each aspect of your hydro system—from water intake to turbine-generator alignment to transmission wire size—affects efficiency. Turbine design is especially important, and must be matched to your specific head and flow for best efficiency. A hydro system is a series of interconnected components. Water flows in at one end of the system, and electricity comes out the other. Here is an overview of these components, from the water source to the electrical controls. 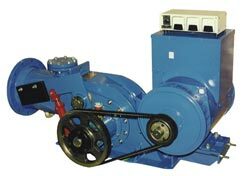 This variable-flow, crossflow turbine uses a belt-drive coupling to a 40 KW synchronous generator. The intake is typically the highest point of your hydro system, where water is diverted from the stream into the pipeline that feeds your turbine. 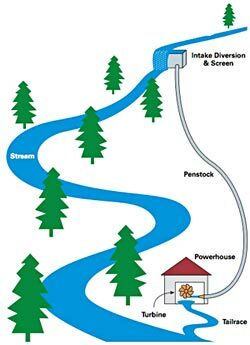 A diversion can be as simple as a screened pipe dropped into a pool of water, or as big and complex as a dam across an entire creek or river. A water diversion system serves two primary purposes. The first is to provide a deep enough pool of water to create a smooth, air-free inlet to your pipeline. (Air reduces horsepower and can damage your turbine.) The second is to remove dirt and debris. Trash racks and rough screens can help stop larger debris, such as leaves and limbs, while an area of quiet water will allow dirt and other sediment to settle to the bottom before entering your pipeline. This helps reduce abrasive wear on your turbine. Another approach is to use a fine, self-cleaning screen that filters both large debris and small particles. The pipeline, or penstock, not only moves the water to your turbine, but is also the enclosure that creates head pressure as the vertical drop increases. In effect, the pipeline focuses all the water power at the bottom of the pipe, where the turbine is. In contrast, an open stream dissipates the energy as the water travels downhill. Pipeline diameter, length, material, and routing all affect efficiency. Guidelines are available for matching the size of your pipeline to the design flow of your system. As you’ll see in the next article in this series, a small-diameter pipeline can considerably reduce your available horsepower, even though it can carry all available water.Larger diameter pipelines have less friction as the water travels through. The powerhouse is simply a building or box that houses your turbine, generator, and controls. Its main function is to provide a place for the system components to be mounted, and to protect them from the elements. Its design can affect system efficiency, especially with regard to how the water enters and exits your turbine. For example, too many elbows leading to the turbine can create turbulence and head loss. Likewise, any restrictions to water exiting the turbine may increase resistance against the turbine’s moving parts. An in-stream screen keeps debris and silt out of the penstock at the small-stream intake for a microhydro system in Washington. The turbine is the heart of the hydro system, where water power is converted into the rotational force that drives the generator. For maximum efficiency, the turbine should be designed to match your specific head and flow. There are many different types of turbines, and proper selection requires considerable expertise. A Pelton design, for example, works best with medium to high heads. A crossflow design works better with lower head but higher flow. Other turbine types, such as Francis, turgo, and propeller, each have optimum applications. Turbines can be divided into two major types. Reaction turbines use runners (the rotating portion that receives the water) that operate fully immersed in water, and are typically used in low to moderate head systems with high flow. Examples include Francis, propeller, and Kaplan. Impulse turbines use runners that operate without being immersed, driven by one or more high-velocity jets of water. Examples include Pelton and turgo. Impulse turbines are typically used with moderate-to-high head systems, and use nozzles to produce the high-velocity jets. Some impulse turbines can operate efficiently with as little as 5 feet (1.5 m) of head. The crossflow turbine is a special case. Although technically classified as an impulse turbine because the runner is not entirely immersed in water, this “squirrel cage” type of runner is used in applications with low to moderate head and high flow. The water passes through a large, rectangular opening to drive the turbine blades, in contrast to the small, high-pressure jets used for Pelton and turgo turbines. Regardless of the turbine type, efficiency is in the details. Each turbine type can be designed to meet vastly different requirements. The turbine system is designed around net head and design flow. These criteria not only influence which type of turbine to use, but are critical to the design of the entire turbine system. Minor differences in specifications can significantly impact energy transfer efficiency. The diameter of the runner, front and back curvatures of its buckets or blades, casting materials, nozzle (if used), turbine housing, and quality of components all affect efficiency and reliability. The drive system couples the turbine to the generator. At one end, it allows the turbine to spin at the rpm that delivers best efficiency. At the other, it drives the generator at the rpm that produces correct voltage and frequency— frequency applies to alternating current (AC) systems only. The most efficient and reliable drive system is a direct, 1:1 coupling between the turbine and generator. This is possible for many sites, but not for all head and flow combinations. In many situations, especially with AC systems, it is necessary to adjust the transfer ratio so that both turbine and generator run at their optimum (but different) speeds. These types of drive systems can use either gears, chains, or belts, each of which introduces additional efficiency losses into the system. Belt systems tend to be more popular because of their lower cost. Refers to the quantity of water supplied from a water source or exiting a nozzle per unit of time. Commonly measured in gallons per minute (gpm). A type of reaction hydro-turbine used in low to medium heads. It consists of fixed vanes on a shaft. Water flows down through the vanes, driving the shaft. Lost energy due to pipe friction. In hydro systems, pipe sized too small can lead to serious friction losses. The difference in elevation between a source of water and the location at which the water from that source may be used (synonym: vertical drop). Expressed in vertical distance or pressure. A flume or channel that feeds water into a hydro turbine. Any electricity that is generated by the flow of water. Turbines with runners that operate in air, driven by one or more high-velocity jets of water from nozzles. Typically used with moderate- to high- head systems. Examples include Pelton and turgo. The structure that receives the water and feeds it into the penstock (pipeline). Usually incorporates screening or filtering to keep debris and aquatic life out of the system. 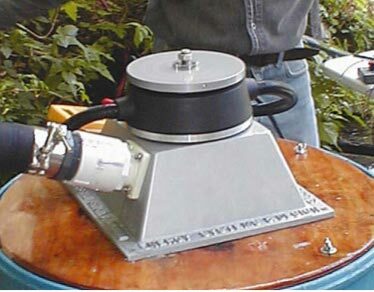 A common impulse turbine runner (named after inventor Lester Pelton) made with a series of cups or “buckets” attached to a hub. The pipe in a hydro system that carries the water from the intake to the turbine.